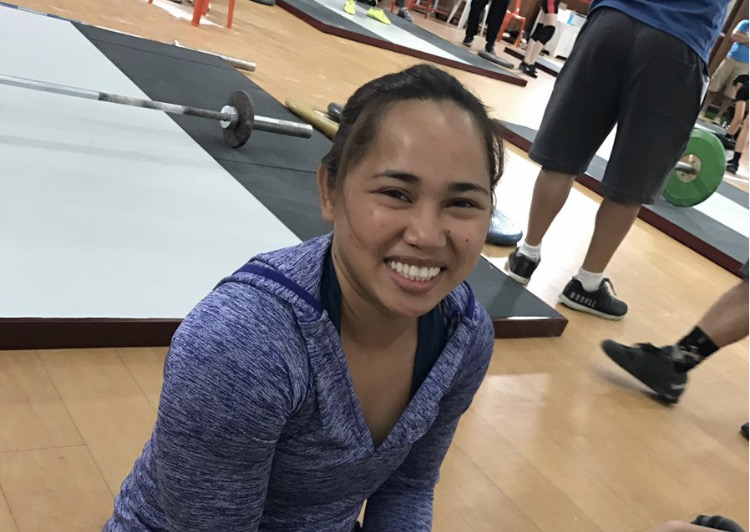 Fresh off winning the gold medal in the women’s 58-kg category of the 2017 Hidilyn Diaz Weightlifting Open Championships (HDWOC), Maria Dessa Delos Santos cried immediately after her last lift. After drying her eyes for the awarding ceremony, tears fell again as she ran to the back, a jacket with the Philippine colors quickly covering her head. When Delos Santos talked to the media, tears once again welled in her eyes. A few steps away, Hidilyn Diaz, the silver medalist at the 2016 Rio Olympics, looked on. “Ate, una na kami ha?” Delos Santos told Diaz right after finishing the interview as she was about to leave the Meralco Multi-Purpose Hall with some of her teammates and coaches. Diaz, who knew exactly was going on, stretched out her arms. The young lifter crashed onto her shoulder and started crying again. The tears falling in her eyes were not of joy but frustration. The gold medal that hung around her neck brought her no comfort. Most of the lifters in the competition were able to block out the crowd when they went on stage. With the lights beaming in front of them, many described the feeling like they were alone in a room with nothing but the barbell and iron plates. Not Delos Santos. She was visibly bothered by the pressure mounting on her young shoulders. Her coaches shouted instructions. She looked at them and said something back instead of focusing on the task at hand. She failed her last two attempts at clean and jerk but her scores were still more than enough to win the category. Diaz offered no words of advice as she put her arms around Delos Santos, she allowed the young lifted to cry it out. Delos Santos’ coaches were visibly disappointed with her performance but the Olympic silver medalist offered no judgment, just a shoulder to cry on.